by referring customers to this site!" If your website receives visits from people within the scope of arrival of the Manual (ie people who are experiencing a difficult time, abandoned by their partner, to a lower economic status, etc. ), then this could be a excellent opportunity for you. And I tell you why. Incredible 75% commission. You get a surprising 75% of my income for every sale you refer. An extremely low return rate. The manual I wrote is infallible, and hundreds of clients whom I have worked with, have been extremely satisfied. There is no need to worry about the payment you will receive. The affiliate program that I use is handled by an impartial third company, Clickbank. This brand gives you 100% assurance that you are paid. You should already know, if you are related to affiliate programs that it is a big problem because when a payment provider himself manages its own affiliate program is often tempted and "forgets to pay your commission". By using Clickbank, a third impartial company, there is no need to worry about that problem. Payments on a regular basis, you will have a steady cash flow. The company mailed Clickbank checks every 7 or 14 days (The choice is yours). There are no "losses". If you look at other sites offering digital products, you'll see they have payment options that are not Clickbank, for example buyers send a money order or make them pay directly through PayPal. These cases would mean lost commissions for you. But you can see, there is no such "loss" on my site. Subsequent related products. Other related products marketed related to esoteric subject that will bring you extra fees beyond the initial sale. STEP ONE: Create your Clickbank username if you haven’t already done, to obtain your account ID. To do it, follow this link (Click where it says "No nickname? Click HERE to sign up first." At the bottom left). 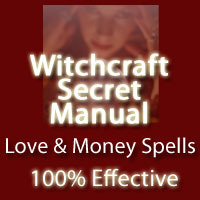 STEP TWO: Once you've obtained your account ID, you must create your hoplink (link to promote witchcraftsecretmanual.com) to link from your site or system of mail you send. Easy and Simple, there are only these 2 steps. Banner ads (728x90, 468x60, 200x200, 120x300, 120x90). Soon more options. For those members who require it, we can develop a promotional content, to promote our Digital Manual. Good luck to you and thank you for your interest again! (c) Copyright 2015 All rights reserved. No reproduction / copy all or part of this information. We will take legal action against someone who copy content of our web site.